The full moon in Libra (March 20-21) peaks a few hours after the sun moves from Pisces to Aries (tonight at 10:42pm ADT), from water to fire, from the end to the beginning, from collective consciousness to individuality and self-concept. Libra, more so than any of its zodiacal neighbors, sees the grey. Not only does Libra see the grey, it knows that truth lies somewhere in that space, and Libra loves a philosophical quest for truth. The Libra archetype reminds us that we all have shadows and light within us while also highlighting that grey is not only not boring — it’s intricate, trippy, and revelatory. Enter: the stripped down psychedelia of Yayoi Kusama and Bridget Riley and Vedic Meditation a la The Broad Place. More on this below. Libra is a cardinal sign and cardinal, in astro-lingo, denotes beginnings. Cardinal signs (Aries, Libra, Capricorn, and Cancer) signal the start of a season. These signs are the initial impulse to action, the first few strokes in a painting. And full moons are all about a culmination of energy. Look to where your energy was during this month’s new moon in Pisces (March 6) for clues as to what might culminate for you during these next few ultra-charged days. It’s a big galaxy and lots of entities influence tonight’s full moon. Uranus holding steady in Taurus provides a revolutionary-rebel air and don’t forget: Mercury is still retrograde in Pisces, so communication and movement might feel less quick and more like wading through a thick swamp. Venus and Mars are aspecting the moon, bringing to the forefront some tension between the masculine and feminine. But tension is energy and when used for good, it’s a fast track to growth. And what do astrology, meditation, and art teach us if not: it’s not good or bad, it’s energy. This is all to say that the full moon in Libra has the potential to shed light on (for better or worse) — relationships, masculine (active) and feminine (receptive) energies, and the intricacies of the grey zone. Libra = the other, partnerships, balance, harmony, beauty, mental energies. Aries = the self, individuality, forthcomingness, activity, fiery physical energies. Around the time of the new moon earlier this month, I learned integrated meditation from the hilarious and wise Jac of The Broad Place, which was an incredible experience and I’m sure I’m only beginning to understand the ways in which it will impact my life. Now, at the full moon, I find myself committed to my meditation practice, less judgmental, and a little less self-obsessed. It’s a process, okay!? During the three-day course, the attendees meditated together. And there’s nothing more full moon in Libra than having a solitary experience in a room filled with people. Libra knows that the group lifts the individual up, urging the self without pushing the self to go deeper. Or: The self drops away and so we experience the Self. The Vedic Meditation technique I learned from Jac is accessible, grounded, and does not discriminate. Meditation makes space for the illustrious (and sometimes dull) grey zones which the full moon in Libra clarifies. (Example: My Libra father’s favorite phrase is “It’s all grey.”) And meditation is not always (and in fact, isn’t usually) a trippy, explosive, David Lynch-ian supernova. It’s…grey. Beneath judgement, ideas of self, and layers upon layers of accumulated programming, we’re grey. And Libra declares: that’s kind of liberating. The person next to you can never truly know your experience as you sit with eyes closed and mind diving, but you both have the knowledge that the other has known the grey, is the grey. And grey is, well, nuanced. 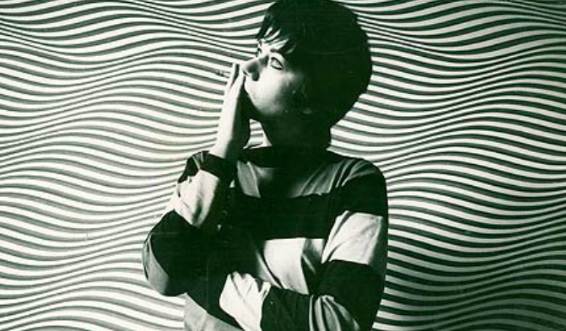 The Op Art of Bridget Riley offers the monochromatic brilliance of the Libra-Aries polarity. Color is both observable aura and event. The farther you stand from her paintings, the more intense the experience becomes. The distance offers shimmering, flickering, and swirling. There are myriad ways for greyscale to hit the eyes. The eyes get hypnotized and where the eyes go, the brain follows. The brain likes changes, which is perhaps one reason the ego is averse to meditation while the brain wants it. On some level, we know that when we close our eyes and drop into that place (the grey monochromatic hypnotic blah and brilliant place) what we experience are subtler changes than the more obvious happenings of daily life. The brain relishes the break that is not really a break, but a chance to witness the mind in full swing. The brain pulls the body back to the broad and specific grey place. And so, we change. The full moon in Libra is a climactic. It says: Dive deeper into the monochromatic depths of your own mind. And, in turn, gain a more nuanced understanding of self and others. Like, right now. Read Jac’s (The Broad Place) daily letters here.